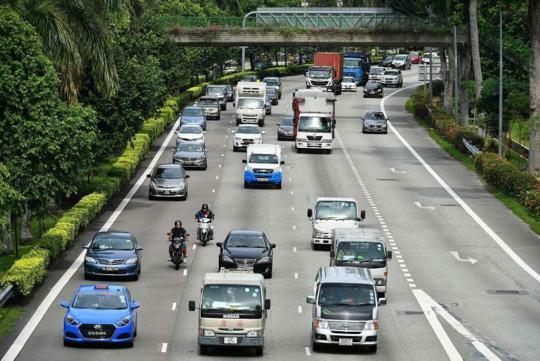 Singapore's vehicle population, led by cars, has shrunk for the third consecutive year. According to statistics released by the Land Transport Authority this week, there were 956,430 vehicles on the road as of 31st of December last year. This is about 0.1 percent lower than in 2015, and 1.8 percent lower than the peak in 2013. The private car population fell by 4 percent to 552,427 - the lowest in eight years. Observers attribute the fall to a clawback of certificates of entitlement (COEs) in the early 2010s to correct an earlier oversupply. The contraction is also attributed to a near-zero allowable yearly growth rate instituted for the COE system. This growth cap has been lowered systematically in recent years - from 3 percent to 1.5 percent in 2009, then to 1 percent in 2012, 0.5 percent in 2013 and 0.25 percent since 2015. There is usually a lag between the time a car is scrapped and a new COE is recycled back into the system. Previous growth rates were able to mask this lag, but not the near-zero cap in place now. SIM University economist Walter Theseira said, "Given the policy goal to keep vehicle growth minimal or even static in the future, the expectation clearly is that reliance on public transport, as well as on private-hire vehicles and taxis, must increase to satisfy transport demand with a growing population." The trend is underscored by a spike in rental car numbers. Last year, their population grew 75 percent to a record 51,336. The figure has grown by over three times since ride-hailing apps Uber and Grab entered the market in 2013. Kah Motor general manager Nicholas Wong said private-hire cars "have displaced private passenger cars as well as taxis". Statistics show that the taxi population has fallen by 2.6 percent to a five-year low of 27,534. Mr Wong said the private passenger car population could continue to shrink. But transport consultant Bruno Wildermuth said that should be the way to go. "For Singapore to become 'car-lite', the number of cars has to decrease, and cars must be used less. Currently, because of the high cost of owning a car, many drivers use the car even when it makes little or no sense." To counter this, he said, COE expiry should be pegged to mileage clocked by a car instead of years. Dr Theseira said the ramp-up of bus services and rail infrastructure "will meet reasonable growth in demand" for transport. "However, the public transport system clearly cannot satisfy demand for private transport as a status symbol," he noted. "The public transport system also does not completely satisfy the transport needs of groups such as young families and the elderly, and professions with irregular travel patterns. "Private transport will continue to be a key part of our transport system for many years to come." Motorcycles - another form of private transport - have dwindled in numbers too. Last year, the population fell to 143,052, its lowest in 10 years. This has put a squeeze on motorbike COE supply, which sent prices beyond the reach of many low-income earners who rely on two-wheelers. Experts said it is not possible for Singapore to meet everyone's private transport aspirations. Nanyang Business School adjunct associate professor Zafar Momin said, "For some people, this may be an unfair outcome as they may need the car more than those who have the means to own one. "However, with an improving standard of public transport, this pain point might be softened." The following article is written by Christopher Tan, a Senior Transport Correspondent with The Straits Times.